Assala Mostafa Hatem Nasri was born 15 May 1969 is a Syrian musical artist, Asalah was born in Damascus, Syria to a middle class couple. Mostafa Nasri, Asalah’s father, was a revered Syrian composer and singer. Asalah began her musical career by performing patriotic, religious, and children’s songs when she was four years old. She sang the theme song “Qessas Al Sho’oub” of the cartoon show, Hekayat Alamiyah . In 1986, Mostafa Nasri died after suffering from internal bleeding caused by a car accident. Aged 17 she helped care for her siblings, Reem, Amani, Ayman and Ayham with her mother. Asalah’s commercial musical career debuted in 1991 with Law Ta’rafou, The album had 4 songs in the oriental operatic tarab style. 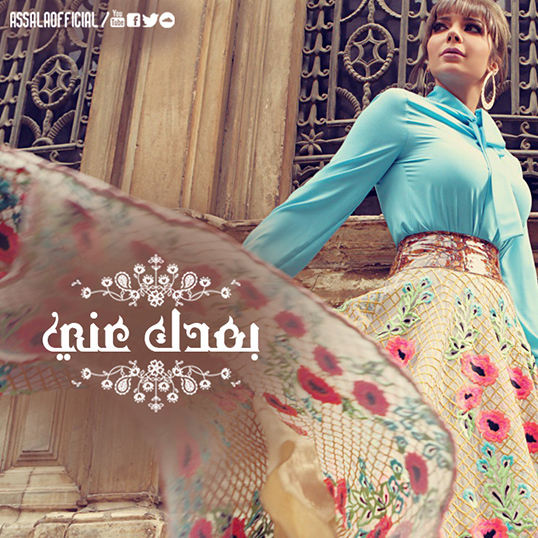 The album was an instant hit with heartbreaking songs like Ya Sabra Yana and Samehtak Ketir. She quickly cemented her presence in a growing industry brimming with new, young talent like Najwa Karam, Saber Rebai, Angham, and Abdelmajeed Abdullah. Asalah has four children two from her first marriage to Ayman Al Dahabi and The other two are twins from Tarek AlAryaan . She currently has custody of both their children, Sham and Khaled. She is now married to famous Palestinian-American director Tarek Al Aryaan. She was pregnant with Tarek’s child in early 2007 but suffered a miscarriage halfway through the pregnancy. Asalah is a Sunni Muslim. She was granted Bahraini citizenship by Bahraini King Hamad bin Isa Al Khalifa a few days after she gave a spectacular performance in the operetta Love and Loyalty in celebration of Bahrain’s Independence Day. Asalah holds three citizenship; Syrian (Mother Nationaltity) Bahraini (Second Nationality). Brighten star Asala Nasri her nails since I began singing at the age of seven years in the global stories and stories of peoples, as well as they sang and sang songs for children in the Syrian national events and took care of her father, Mustafa Nasri in this field. Her father died in 1986 and his death had a major impact on her life, I stopped singing for three years and served as the spiritual father of her brothers and aspirations of young Reem and Anas and which are responsible for them. A girl (Sham) and son (Khalid). Made famous in the Arab world after the album, “If you know” in 1993, and who sang it to the top composers of the Egyptians. From the album: “and incredible” and “angered” and “Alli was” and “My heart Berthalk?” And “crazy” and “right hand of God.” Participated in many festivals, Arabic song, and won numerous awards. Characterized by sound artist authenticity Nprath strong sense of delicate and significant impact in her songs. Originality involved in many Arab and international festivals and was also hosted in a lot of television programs and was overlooking a significant impact on the LCD screen with viewers. – Sawaha Galbi (My Heart Has Done It) (2007), debuted at number 1, stayed for 4 weeks at number 1 beating Amr Diab’s new album on Rotana’s PEPSI Top 5. – Nos Halah (Half Situation) (2008), debuted at #1 of Rotana’s Top 5 albums on both Egypt and Lebanon, stayed in the charts the following week. In its third week it peaked back at number 1 at Egypt Top 5 albums charts. In the following weeks it peaked at number 2 on the Khaleeji, the making it the first album to be in the top 2 of all charts. – Best artist in 1994 in Dubai. – Dar Al Bayan Award referendum conducted by the Journal of Family, Youth and Sports (MBC) in 97 m of the best singer. – Dar Al Bayan Award referendum conducted by the Journal of Family timid family, sports and youth and (MBC) for the year 98 AD, the best singer. – Award for the Middle East, Egypt in 1998. – Dar Al Bayan Award referendum conducted by the Journal of Family, Youth and Sports (MBC) for the year 1999, the best singer. – Award for the Middle East, Egypt in 1999. – Award from the United Arab Emirates FM Radio for the year 1999. – Award for the Middle East, Egypt in 2000. – Dar Al Bayan Award referendum conducted by the Journal of Family, Youth and Sports (MBC) for the year 2000 as the best singer. – Courtesy of the Department of moral Arab Republic of Egypt as well as the prize giving for the year 2000. – Prize giving for the year 2000 (Arab American Music, Arts & Literature Award 2000). – Award as the best Arab artist by the referendum on the Gulf of flower magazine in 2001. – Many of her songs won the admiration of audiences and won the first prize for the year 2001. – Award by the Lebanese through the statistics compiled by the Statistics Lebanon as the best Arab singer for the year 2001. – Also, many of her songs won the admiration of the masses and also won the first prize for the year 2002. – Oskaralgmehor Award of the Journal of cinema and the people (Lebanese American Foundation). – Mahdatin two awards from the Mayor of the mandate of Las Vegas, and New Jersey State Alomirikitin. – Best Female Singer Award for the year 2005-2006 AD. – Award Almyoriks role as the best Arab singer of 2007. – ART Award as the best Arab singer, 2008. – Certificate of Appreciation from the Union of Revolutionary Youth (1982 m) Syrian Arab Republic. – Estimate of innocence Artists Association (1985 m) Syrian Arab Republic. – Courtesy of the band of gold in 1992. – Certificate of Appreciation from the cultural center of the first Egyptian Opera in 1993 in Egypt. – Certificate of Appreciation from the General Authority for Television in 1995, Syria. – Certificate from the Jerash Festival in Jordan in 1995. – Certificate from the Cairo International Festival for the second song (Gold Award) in 1996 to Egypt. – Certificate of Merit from the General Authority for Radio and Television in 1997 in Syria. – Certificate from the Beirut International Festival for the first in 1997. – Certificate of honor of the graduates of military colleges and universities of Egypt in 1999 in Egypt. – Certificate from the National Committee for Prisoners and Missing in 1999 in Kuwait. – Patent certificate of appreciation from the Association of Artists in 1999 to Syria. – Certificate of appreciation from the Hala February for the year 1999 in Kuwait. – Certificate of Appreciation from the Jerash Festival for Culture and Arts in 2000, Jordan. – Certificate of Merit from the Syndicate for the year 2000, Arab Republic of Egypt. – Murex D’or Award as the best Arab singer in 2006. – Murex D’or Award as the best Arab singer in 2007.